Aim: The present study aims to correlate AMH and AFC, with the number of retrieved oocytes , number of Grade1 embryos and clinical pregnancy in IVF/ICSI cycles stimulated with GnRH-antagonist protocol. Materials and Methods: 49 women who underwent grade 1 cleavage stage fresh embryo transfer from May to August 2017 were included. Primary end point was clinical pregnancy i.e. positive cardiac activity at 6 weeks. Pearson’s correlation coefficient was calculated and stepwise regression analysis was done to identify the best predictor. Results: Out of 49 patients 21 patients (42.9%) were pregnant. Serum AMH and AFC significantly correlated with the number of oocytes obtained (P=0.00, P=0.00). A positive correlation of serum AMH and AFC was seen with number of grade 1 embryos , but it was not significant. AFC had a stronger correlation with number of oocytes and grade 1 embryos than AMH . Stepwise regression analysis indicated that number of grade 1 embryos was an independent predictor for clinical pregnancy (P= 0.19) with an overall accuracy of 63%. Conclusion: Counselling of patients regarding outcome of IVF cycle should be based on the number of grade1 embryos. The ovarian reserve is the size of the follicular pool that is established during the fetal life. A gradual depletion of the follicle pool occurs during a female’s reproductive life. Therefore, an estimation of the ovarian reserve of a female is of paramount clinical importance for determining the fertility potential of women. Maternal age, serum anti mullerian hormone (AMH) and antral follicle count are the common tools to assess ovarian reserve in clinical practice. Basal follicle stimulating hormone (FSH) and serum estradiol levels are influenced by the hormonal status of the patient, show intracycle fluctuations and are not preferred. The markers of ovarian reserve such as AMH and antral follicle count (AFC) are determinative for the number of retrieved oocytes in a stimulated cycle for in vitro fertilizatrion (IVF). However, the predictive value of AMH or AFC for clinical pregnancy or live birth is variable and conflicting. Our study aims to find out the correlation of AMH and AFC with the number of retrieved oocytes and the number of Gd1 embryos in women undergoing IVF/intracytoplasmic sperm injection (ICSI) cycles stimulated with a gonadotropin releasing hormone (GnRH)-antagonist protocol. The AMH level, AFC, the number of retrieved oocytes and the number of Grade 1 embryos will be assessed for the prediction of clinical pregnancy. This retrospective study included 49 women undergoing IVF at our IVF department from May 2016 to August 2016. The inclusion criteria were (1) age 25–45 years, (2) the presence of both ovaries, (3) patients stimulated with antagonist protocol and (4) patients in whom fresh embryo transfer was performed. The exclusion criteria were (1) patients stimulated with protocol other than GnRH antagonist, (2) patients in whom embryo transfer could not be done in the present cycle due to the risk of hyperstimulation or thin endometrial thickness (ET), (3) patients in whom severe male factor infertility was present and (4) patients undergoing donor or surrogate cycles. Before starting ovarian stimulation, on Day 2 of a spontaneous menstrual cycle, patients underwent a transvaginal ultrasound scan for the estimation of AFC. It was conducted by measuring all the visible follicles in both the ovaries. On the same day, a peripheral blood sample was obtained for the measurement of serum AMH and baseline hormonal levels. AMH levels were measured with a Generation 2 ELISA kit. The sensitivity of the kit was 0.025 ng/ml, and intra- and interassay variation of the assay was 7%. Recombinant FSH or urinary purified FSH was used for ovarian stimulation starting from Day 2 of the cycle. The starting dose was chosen on the basis of age, FSH, body mass index (BMI) and experience from previous cycles. FSH doses were further adjusted according to ultrasound findings and estradiol measurements during monitoring. GnRH antagonist was added from Day 5 of the cycle. When at least two follicles reached a diameter of 18 mm, 250 μg of recombinant hCG was administered, and 35–36 h later, oocyte retrieval was performed. The embryos were cultured in 37°C, 5% CO2 and humidified atmosphere. Each day, the embryos were scored by a senior embryologist according to the criteria given by ESHRE Istanbul. Embryo transfers were performed at the cleavage stage (Day 2 or Day 3) under ultrasound guidance. The best-quality (Grade 1) embryos determined using ESHRE Istanbul criteria were transferred. Luteal phase was supported with vaginal micronized progesterone and intramuscular progesterone (50 mg I/M) on every alternate day. Serum b-hCG > 50 mIU/l was considered as positive. Clinical pregnancy was defined as a viable intrauterine pregnancy (positive cardiac activity) on transvaginal ultrasound scanning performed at 6 weeks of pregnancy. The main outcome measures were the number of oocytes retrieved, the number of Gd1 embryos and clinical pregnancy. Data were analyzed with the Statistical Package for the Social Sciences version 20 software (SPSS Inc., Chicago, IL, United States). The frequencies of the variables were computed. Pearson’s correlation was calculated for a correlation of the variables. Clinical pregnancy and age-wise comparisons were based on t-statistics (for two groups) or one-way analysis of variance (for more than two groups). The prediction probability of clinical pregnancy was based on logistic regression models by estimating the parameters using forward likelihood technique. P value <0.05 was considered significant for all statistical tests. Out of the 49 patients, 24 patients (48.9%) had a positive beta-hCG test. The clinical pregnancy rate was 42.8%, that is, 21 patients out of 49 patients had positive cardiac activity at 6 weeks of gestation. Demographic data and parameters related to the outcome of ovarian stimulation are presented in [Table 1]. AMH was positively correlated with AFC (r = +0.648), the number of oocytes retrieved (r = +0.508) and the number of Gd1 embryos (r = +0.22). 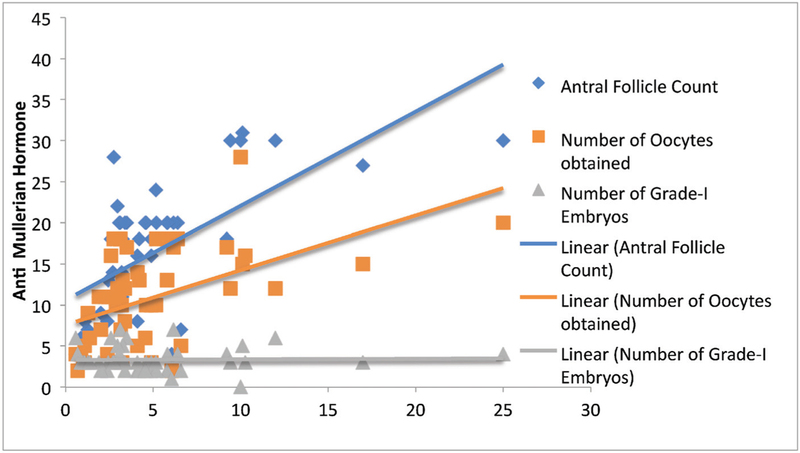 A significant positive correlation of AMH was seen with the number of oocytes retrieved (P = 0.00) [Figure 1]. AFC was positively correlated with the number of oocytes retrieved (r = 0.743) and the number of Gd1 embryos (r = +0.215). The significant positive correlation of AFC was seen with the number of oocytes retrieved (P = 0.00) [Figure 2]. Among the AFC and AMH, AFC was found to have a stronger correlation with the number of oocytes retrieved than AMH (r = 0.743 vs. r = 0.507). The studied parameters, that is, AMH, AFC or the number of oocytes, were not found to be significantly different in clinical pregnant vs. nonpregnant group. The only parameter that was significantly different was the number of Grade 1 embryos. It was found that the mean number of embryos in the clinical pregnant group was 3.9, with 2.9 in nonpregnant group [Table 2]. 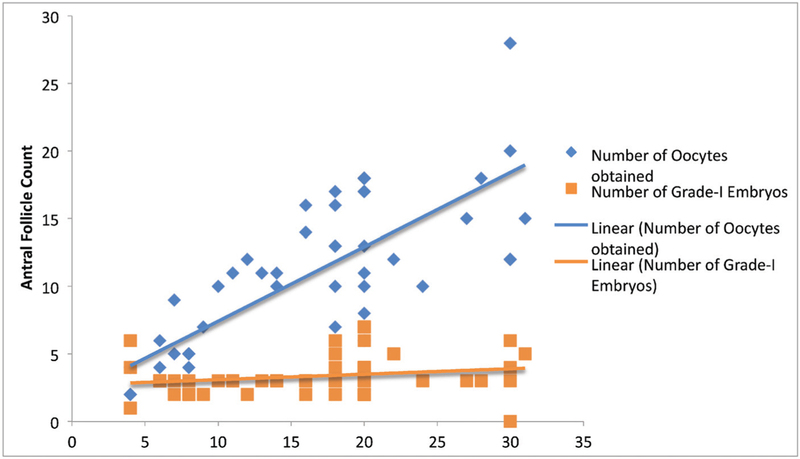 Stepwise regression analysis showed that the significant parameter for the prediction of the clinical pregnancy was the number of Grade 1 embryos (r = 2.421, P = 0.019). The number of Grade 1 embryos is an independent factor for predicting clinical pregnancy. The positive predictive value of Grade 1 embryos for clinical pregnancy was 78.6%. The negative predictive value was 42.9%. Overall, the accuracy of Grade 1 embryos to predict clinical pregnancy was 63%. A linear relationship between oocyte yield and AMH level has been observed in the previous studies., The results of our study also show that AMH is significantly correlated with the number of retrieved oocytes in women stimulated with GnRH-antagonist protocol. The direct comparisons of AFC and AMH level have shown similar predictive value for ovarian response and outcome with one prospective, multicentre study that indicated a significantly stronger predictive value for AMH and three others that demonstrated a stronger predictive value for AFC.,,,,,,,, The results of our study showed that between AMH and AFC, AFC had a stronger correlation with the number of oocytes retrieved. In previous studies, AFC has not been shown to be predictive of embryo quality., Only one study has directly suggested that AMH level may also predict embryo quality. In our study, although AMH and AFC are positively and linearly correlated with Grade 1 embryos, the strength of correlation was not significant. Thus, our results support the previous studies that AMH and AFC could not predict embryo quality. Given that AMH is associated with oocyte yield and oocyte yield has been shown to be a strong predictor of live births, it is plausible that AMH level could be used to predict pregnancy outcomes. Findings from several large-scale retrospective analyses of women undergoing IVF found a positive association between AMH level and live birth rates.,, A recent prospective study in nearly 900 women undergoing 1230 IVF cycles confirmed these findings, reporting that AMH level is strongly associated with both pregnancy and live birth rates, independent of age and oocyte yield. However, other studies have not shown an association between AMH level and pregnancy rates or live births including two separate meta-analyses.,,, A third meta-analysis found a weak association between AMH level and implantation and clinical pregnancy rates. Thus, AMH may be useful in predicting pregnancy and live birth rates, but further prospective analyses are still needed. In our study, AMH was not found to be a predictor of clinical pregnancy. Two large studies (with 734 and 2092 participants, respectively) on the prediction of live birth after IVF treatment using the thresholds of AFC cohorts produced conflicting results., Another study demonstrated a strong positive relationship of AFC, independent of age, with live birth. Recently, another study has demonstrated that AFC is not a predictor of clinical pregnancy in poor responder patients. In our study, AFC was not found to be a predictor of clinical pregnancy. A study conducted comparing the embryo transfer of top-quality embryos with poor-quality embryos showed a higher clinical pregnancy rate (41.5%) and live birth rate (32.3%) in the good-quality embryo transfer group compared with that in the poor-quality transfer group (19.2 and 15.5%). In our study, when we compared pregnant vs. nonpregnant women, the only statistically different parameter observed was the number of Gd1 embryos. Because in our study only Grade 1 embryo transfers on Day 2 or Day 3 were included, we can conclusively say that the embryo quality was the only significant parameter for predicting clinical pregnancy rate. A major limitation of our study is the small sample size, which limits the generalization of our findings by making them arguable in terms of statistical power. Another limitation is that clinical pregnancy rate was used rather than live birth rate because of the inclusion of pregnant women who did not give birth during the study period. The other limitations of this study are the retrospective nature of the study. In addition, different subgroups of the patients wherein ovarian response can be categorized as normal, poor or hyper-responders need to be analyzed in detail to make further conclusions. Our study concludes that counseling of the patient regarding the outcome of the IVF cycle should not be based on AMH and AFC only. The final word should be based on the quality of embryos, which is an independent factor for the prediction of clinical pregnancy. The factors to predict the quality of embryos may correlate with the cause of infertility, which needs to be elucidated in future studies. Blazar AS, Lambert Messerlian G, Hackett R, Krotz S, Carson SA, Robins JC. Use of in-cycle antimullerian hormone levels to predict cycle outcome. Am J Obstet Gynecol 2011;205:223-5. Tsakos E, Tolikas A, Daniilidis A, Asimakopoulos B. Predictive value of anti-Mullerian hormone, follicle-stimulating hormone and antral follicle count on the outcome of ovarian stimulation in women following GnRH-antagonist protocol for IVF/ET. Arch Gynecol Obstet 2014;290:1249-53. Chang MY, Chiang CH, Chiu TH, Hsieh TT, Soong YK. The antral follicle count predicts the outcome of pregnancy in a controlled ovarian hyperstimulation/intrauterine insemination program. J Assist Reprod Genet 2009;15:12-7. Himabindu Y, Sriharibabu M, Gopinathan K, Satish U, Louis TF, Gopinath P. Anti-Mullerian hormone and antral follicle count as predictors of ovarian response in assisted reproduction. J Hum Reprod Sci 2013;6:27-31. Hsu A, Arny M, Knee AB, Bell C, Cook E, Novak AL et al. Antral follicle count in clinical practice: Analyzing clinical relevance. Fertil Steril 2011;95:474-9. Amer SA, Mahran A, Abdelmaged A, El-Adaw AR, Eissa MK, Shaw RW. The influence of circulating anti-Mullerian hormone on ovarian responsiveness to ovulation induction with gonadotrophins in women with polycystic ovarian syndrome: A pilot study. Reprod Biol Endocrinol 2013;11:115. Broekmans FJ, Kwee J, Hendriks DJ, Mol BW, Lambalk CB. A systematic review of tests predicting ovarian reserve and IVF outcome. Hum Reprod 2006;12:685-718. Broer SL, Mol BW, Hendriks D, Broekmans FJ. The role of antimullerian hormone in prediction of outcome after IVF: Comparison with the antral follicle count. Fertil Steril 2009;91:705-14. Lukaszuk K, Kunicki M, Liss J, Lukaszuk M, Jakiel G. Use of ovarian reserve parameters for predicting live births in women undergoing in vitro fertilization. Eur J Obstet Gynecol Reprod Biol 2013;168:173-7. Panchal S, Nagori C. Comparison of anti-Mullerian hormone and antral follicle count for assessment of ovarian reserve. J Hum Reprod Sci 2013;5:274-8. Brodin T, Hadziosmanovic N, Berglund L, Olovsson M, Holte J. Antimullerian hormone levels are strongly associated with live-birth rates after assisted reproduction. J Clin Endocrinol Metab 2013;98:1107-14. Rosen MP, Johnstone E, McCulloch CE, Schuh-Huerta SM, Sternfeld B, Reijo-Pera RA. A characterization of the relationship of ovarian reserve markers with age. Fertil Steril 2012;97:238-43. Jayaprakasan K, Chan Y, Islam R, Haoula Z, Hopkisson J. Prediction of in vitro fertilization outcome at different antral follicle count thresholds in a prospective cohort of 1,012 women. Fertil Steril 2012;98:657-63. Irez T, Ocal P, Guralp O, Cetin M, Aydogan B, Sahmay S. Different serum anti-Mullerian hormone concentrations are associated with oocyte quality, embryo development parameters and IVF-ICSI outcomes. Arch Gynecol Obstet 2011;284:1295-301. Sunkara SK, Rittenberg V, Raine-Fenning N, Bhattacharya S, Zamora J, Coomarasamy A. Association between the number of eggs and live birth in IVF treatment: An analysis of 400135 treatment cycles. Hum Reprod 2013;26:1768-74. Arce JC, Mirner KB, Nyboe AA, Fleming R. Antimullerian hormone in gonadotropin releasing-hormone antagonist cycles: Prediction of ovarian response and cumulative treatment outcome in good-prognosis patients. Fertil Steril 2013;99:1644-53. Khader A, Lloyd SM, McConnachie A, Fleming R, Grisendi V, La Marca A. External validation of anti-Mullerian hormone based prediction of live birth in assisted conception. J Ovarian Res 2013;6:3. Lukaszuk K, Liss J, Kunicki M, Jakiel G, Wasniewski T, Woclawek-Potocka I et al. Anti-Mullerian hormone (AMH) is a strong predictor of live birth in women undergoing assisted reproductive technology. Reprod Biol 2014;14:176-81. Lin WQ, Yao LN, Zhang DX, Zhang W, Yang XJ, Yu R. The predictive value of anti-Mullerian hormone on embryo quality, blastocyst development, and pregnancy rate following in vitro fertilization-embryo transfer (IVF-ET). J Assist Reprod Genet 2013;30:649-55. Mutlu MF, Erdem M, Erdem A, Yildiz S, Mutlu I, Arisoy O. Antral follicle count determines poor ovarian response better than anti-Mullerian hormone but age is the only predictor for live birth in in vitro fertilization cycles. J Assist Reprod Genet 2013;30:657-65. Broer SL, Dolleman M, Opmeer BC, Fauser BC, Mol BW, Broekmans FJ. AMH and AFC as predictors of excessive response in controlled ovarian hyperstimulation: A meta-analysis. Hum Reprod 2011;17:46-54. Iliodromiti S, Kelsey TW, Wu O, Anderson RA, Nelson SM. The predictive accuracy of anti-Mullerian hormone for live birth after assisted conception: A systematic review and meta-analysis of the literature. Hum Reprod 2014;20:560-70. Tal R, Tal O, Seifer BJ, Seifer DB. Antimullerian hormone as predictor of implantation and clinical pregnancy after assisted conception: A systematic review and meta-analysis. Fertil Steril 2015;103:119-30. Holte J, Brodin T, Berglund L, Hadziosmanovic N, Olovsson M, Bergh T. Antral follicle counts are strongly associated with live-birth rates after assisted reproduction, with superior treatment outcome in women with polycystic ovaries. Fertil Steril 2011;96:594-9. Zebitay AG, Cetin O, Verit FF, Keskin S, Sakar MN, Karahuseyinoglu S et al. The role of ovarian reserve markers in prediction of clinical pregnancy. J Obstet Gynaecol 2017;37:492-7. Oron G, Son WY, Buckett W, Tulandi T, Holzer H. The association between embryo quality and perinatal outcome of singletons born after single embryo transfers: A pilot study. Hum Reprod 2014;29:1444-51.